While visiting my daughter and her family in Athens GA, I went on a marshmallow treat making extravaganza. Every time we stopped at Target, which was just about every day, I would find a ‘new to me’ flavor of marshmallows. Today it was German chocolate cake marshmallows, complete with coconut. If you’re a fan of German chocolate cake or coconut, you’re gonna love these flavored marshmallows. German Chocolate Cake Crispy Treats are delicious. Made in the same way that all marshmallow treats are made but only with a few different ingredients. German chocolate cake marshmallows, cocoa pebbles cereal, caramel ice cream topping and flaked coconut are the starting line-up for this recipe. Sounds like a winning combination doesn’t it?!? Melt butter in a large pan. Add marshmallows, stir until melted. Stir in caramel ice cream topping. Stir until combined. Add cereal, stir until cereal is coated, then stir in coconut. With a buttered spatula, press into a lightly buttered 13 x 9 x 2 inch baking dish. Here is another marshmallow treat recipe you’ll drool over. Chocolate Mint Krispie Treats . 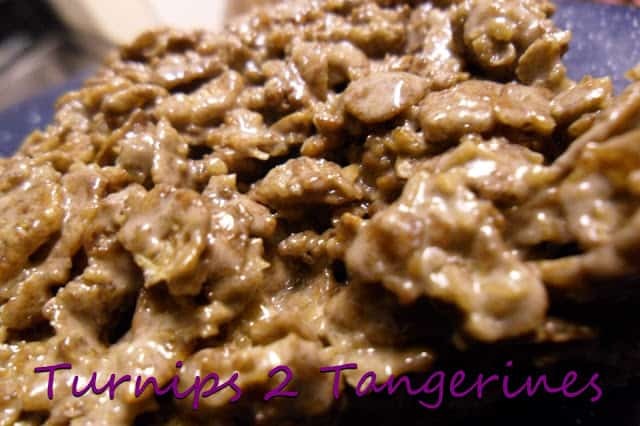 Products used in this recipe include Kraft Marshmallows and Post Cocoa Pebbles. These look great! I didn't know that german chocolate marshmallows even existed. Oh my, those look awesome! I haven't seen those marshmallows but I'll definitely be looking for them the next time I'm at the store. What do you do with the caramel sauce? Is this like Rice Krispie treats?